You are here: Home / Choking Under Pressure / Will Kuchar Win at the Masters? Do You Choke Under Pressure in Tournaments? Did Matt Kuchar choke during the final round of another golf tournament? Did he crumble mentally coming down the stretch at the Houston Open? Or did he just get beat by a couple of incredible shots from Jones? 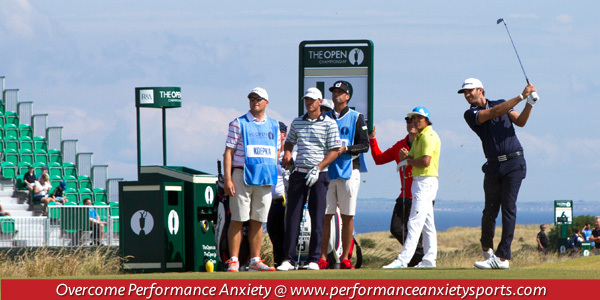 Would you start thinking that you choke under pressure if you let two tournaments in a row slip away? It’s all a matter of perspective-according to Matt Kutchar…. The previous week, despite six top-10 finishes this year, Kuchar failed to pull out a victory at the Valero Texas Open after being tied for the lead. Recently, he squandered a four-shot lead on the final day at the Shell Houston Open- being two stokes in the lead with two to play. Though Kuchar has been one of the most consistent golfers on the tour this year, he has yet to win a tournament. Did Kuchar miss some putts? Yes. Does that mean he cannot win the big one? NO! How did Kuchar respond to these potentially confidence-damaging losses? At the Shell Houston Open, the winner Matt Jones shot one of the best rounds of the tournament, and on the playoff hole, chipped in from more than 40 yards out for the win. A positive perspective isn’t about sugarcoating your play. A healthy perspective requires an honest and realistic assessment of performance-so you can work to improve the next week. You also want to look at what working for you. What are you doing well this week? How can you build upon this? You must honestly look at how to improve you mental game if you are not getting it done down the stretch. What can you do better the next time you are in the same situation? You certainly don’t want to beat yourself up for letting a four shot lead slip away. But a healthy perspective allows you to assess how you can learn from past experience, and then improve for the next time. Improve your mental game today with one on one coaching with Dr. Patrick Cohn.